Last Saturday I was in the mood to bake. I had no idea what I wanted to make, but it at least had to be very chocolaty. Then I remembered a blogpost from Lily Pebbles' Brookies and immediately looked up the post, wrote down the ingredients and went to the grocery store to buy everything. 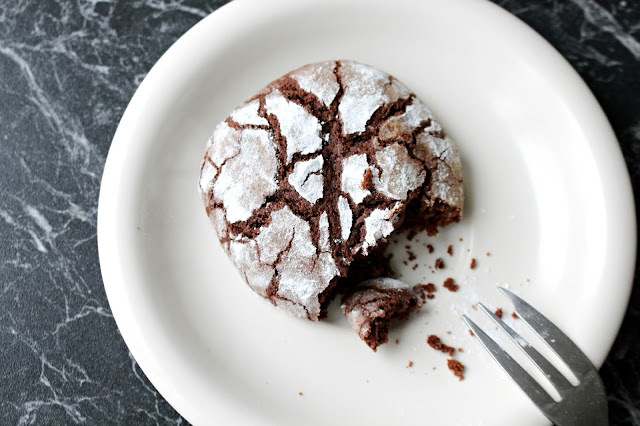 I have to say these brownie cookies are so yummy and look incredible. 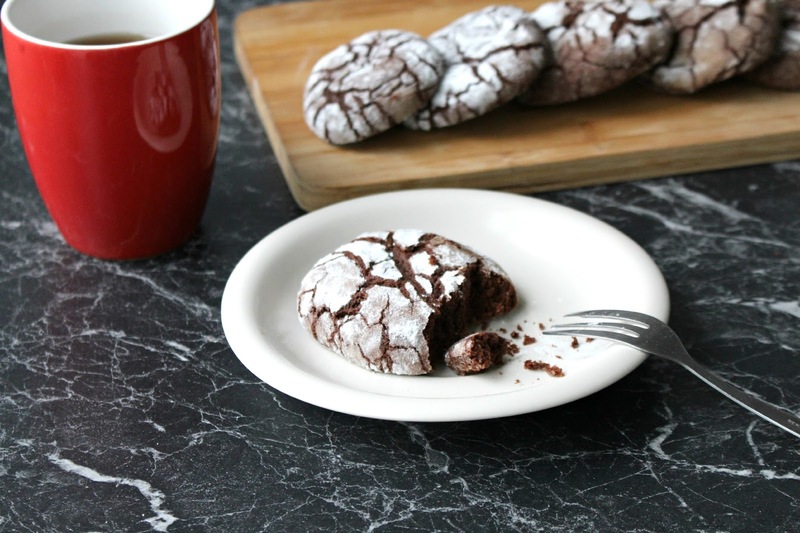 They are everything I want in a cookie: crunchy on the outside, chewy on the inside and full of chocolate! I love the icing sugar effect on the outside as well. It makes them look very luxurious and fancy, while they are not that difficult to make. I hope you like them a lot too! Wat do you need for these yummy cookies? First, mix together the cocoa powder, caster sugar and vegetable oil in a mixing bowl. Then add in the 4 eggs, one at a time, and stir in the vanilla too. Combine the flour, baking powder and salt and stir it into the cocoa mixture. The recipe now says to let the dough chill for 4 hours (!). I was a bit surprised by that, because I didn't read the recipe that well and I just followed the steps as I went along. I wanted to have cookies immediately and not wait for 4 hours, so I put the dough in the freezer for 10 minutes and hoped for the best. Next, line a baking tray with parchment paper and pour the icing sugar in a bowl right beside you. Now get your dough and a metal spoon, scoop the dough and roll them in 2.5cm dough balls. Then roll them in the icing sugar and place them on the baking tray. Now it's time to put these powdered dough balls in the oven for about 10-12 minutes. I made quite large cookies and I found that the cookies needed at least 11 minutes in the oven for them to become perfect. After 11 minutes you take them out of the oven and wait a minute before you transfer them on to a wire rack. They already smell amazing by this point and I couldn't wait for them to be completely cooled down, so I took a bite when they were still warm and I can tell you: they are bloody amazing! I hope you are enjoying Blogmas so far and please let me know if you are going to make these as well. I would love to see some pictures! This feels like such a blast from the past as I remember Lily talking about brookies such a long time ago. They look and sound amazing! You said it - 'crunchy on the outside, chewy on the inside', yum! 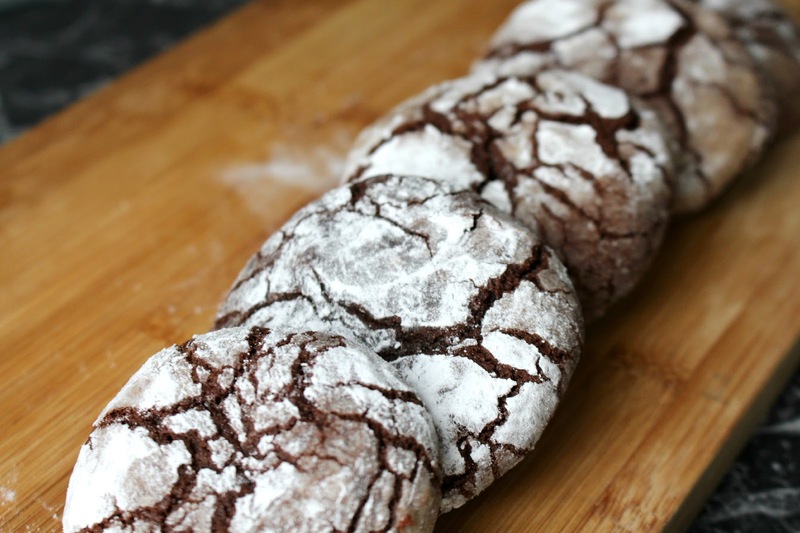 That's the perfect brownie-cookie combination :) I may well give this recipe a go if I get a spare minute. I look forward to reading more of your Blogmas posts!